Venus moves into Leo today and brings with it the flamboyance of the peacock and the warmth of the Sun. The Sun card (following on the heals of the Moon card a few days ago) is all about optimism, enthusiasm and personal radiance. It’s about allowing yourself to “shine,” without any pretense or constraint. Where the Moon card can reflect your doubts and uncertainties, the Sun reflects your strengths and capabilities. It’s about following your bliss and manifesting your own personal radiance. The woman in this card could probably use a spot of Sun. She looks off over her shoulder at something (or someone) that’s caused her obvious distress. In the foreground is a peacock — looking off in the same direction. And notice the child’s hand reaching up from the bottom of the card. The Sun reflects your own inner light and inspires you to let it shine. It encourages you to say yes to life rather than letting your troubles hold you back. It tells you to turn your face to the Sun rather rather than looking back over your shoulder toward whatever caused you to dim your light in the first place. Aside from the obvious penchant for drama and flair, the peacock as an animal totem is also said to represent honor and integrity — two very prominent Leo traits. Also like Leo, it likes to make an entrance, to stand out in a crowd and to be worshipped and adored by others. The tiny hand poking up from the bottom of the card reminds you to embrace your inner child. It’s a symbol of openness, trust and purity; it speaks of being in the moment and at one with the Universe. Open your heart chakra today as Venus moves into Leo. This ensures that you will find your rightful place between the Sun (warmth), the Peacock (beauty) and the Child (love). 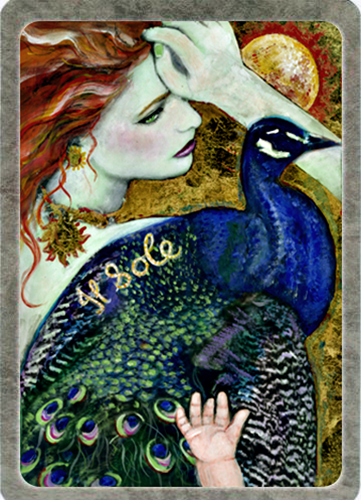 This card — the Sun — comes from the Secret Language of Birds Tarot series by Adele Nozedar (author) and Linda Sutton (artist), distributed by Schiffer Publishing. Adele Nozedar has also written several other books on signs, symbols and magic. The Secret Language of the Birds Tarot was inspired in part by Adele’s earlier (non-tarot) book, Secret Language of the Birds. Linda Sutton is a British painter whose work has been shown in numerous exhibitions.